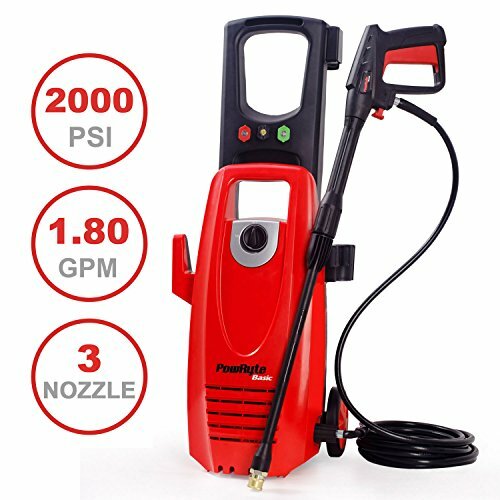 PowRyte 2000Psi Electric Pressure Washer is perfect for cleaning jobs of patios, driveways, outdoor furniture, cars and more. It delivers max 2000 psi pressure at 1.80GPM with 20ft high pressure hose and 35ft power cord with GFCI plug. Equiped TTS (Total Stop System), motor automatic stops when trigger is released decreases power consumption in daily use. Two 15" Wheels and long handle makes offer easy moving feature. Quick connect spray gun with standard 25 degree lance and 0.16 onboard detergent bottle ready for wash at once. ETL listing and 1 year warranty get you protected after purchase. If you have any questions about this product by PowRyte, contact us by completing and submitting the form below. If you are looking for a specif part number, please include it with your message. © 2019 - sunsetvista.org. All Rights Reserved.